This is the first collaboration between Bell & Ross and Bape, and is to celebrate the Japanese lifestyle and streetwear company’s 25th anniversary. Bape announced this partnership, together with 24 others, as part of their celebrations. 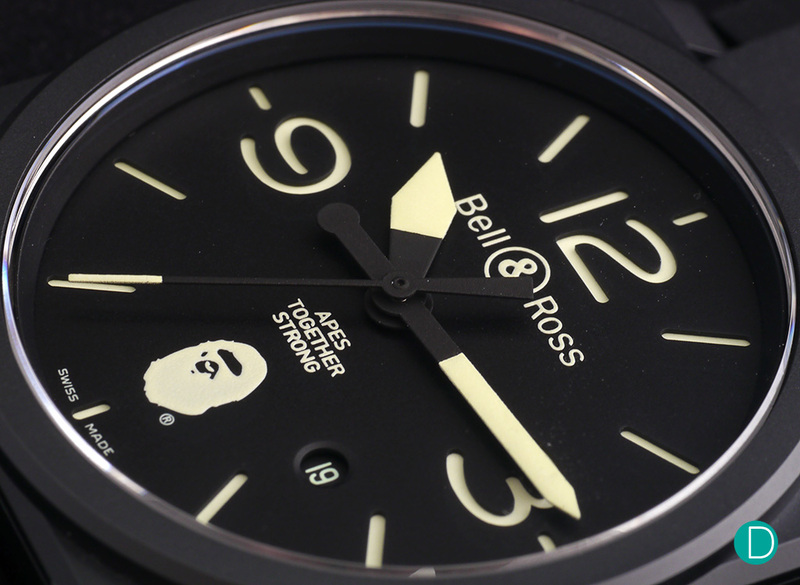 The Bell & Ross collab announced two watches, both limited editions. Both in their iconic square black matte ceramic cases. Here is our hands-on report on the watches. 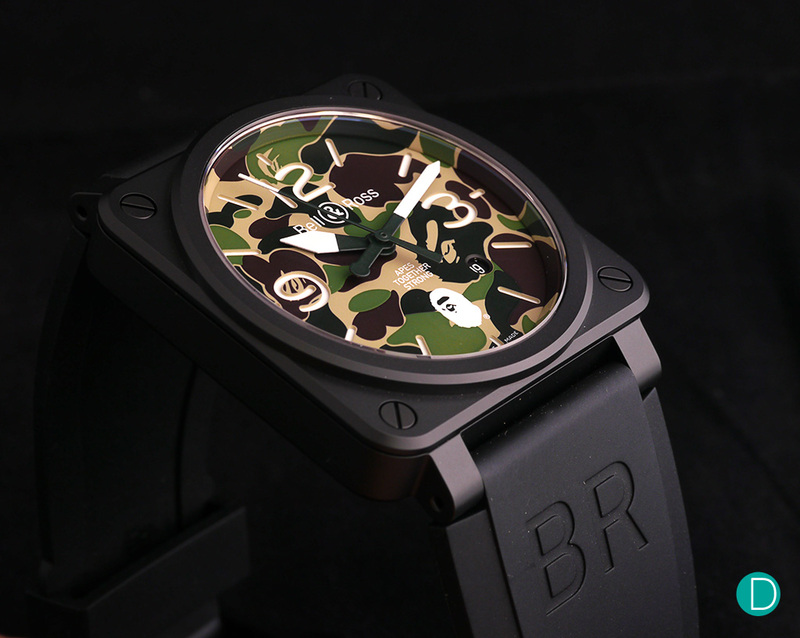 At the point of writing, which is the very same day in which the watches are released worldwide, and the embargo on the press release lifts, we understand all the entire BR X Bape collection is sold out! 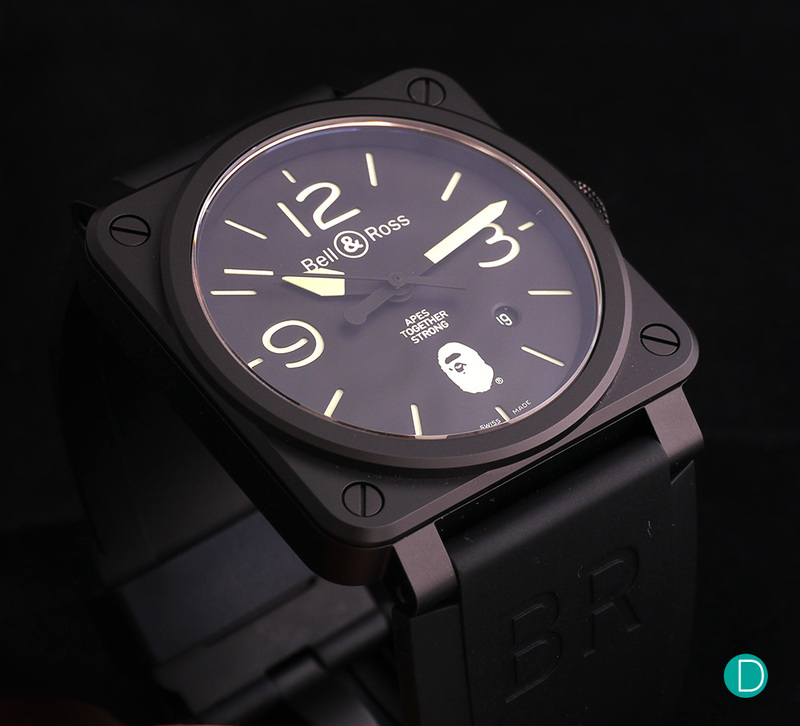 Limited to only 25 pieces the principal model is the Bell & Ross BR03-92 Bape 25th Anniversary model. Bape is a creation of Japanese fashion designer Nigo (Tomoaki Nagao) in Ura-Harajuku in 1993. He named the company after the 1968 film – the Planet of the Apes. According to Nigo, the name “BAPE” is a reference to “A Bathing Ape in Lukewarm Water”. The reference being to the hot baths that Japanese people typically take, either at home, or in a public bath known as sento. As such, to bathe in lukewarm water is to complacently overindulge. 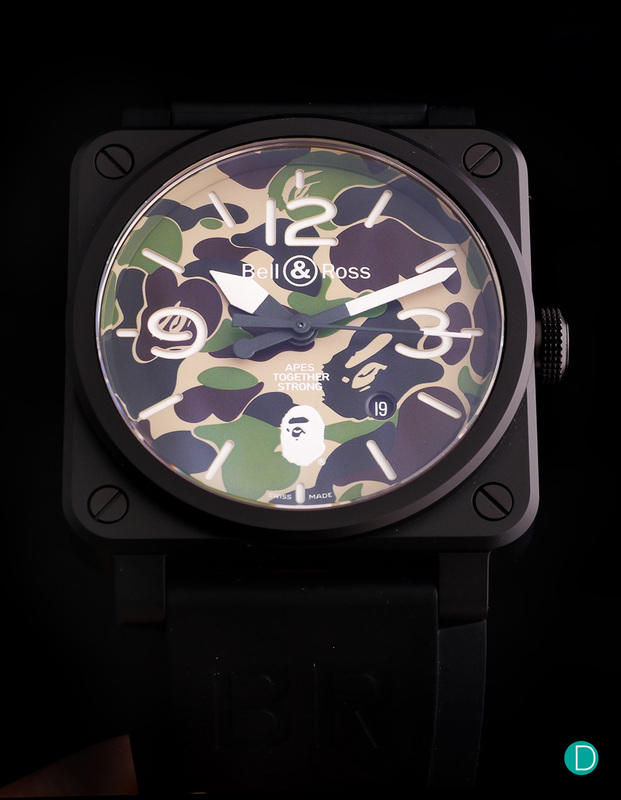 And the second model is limited to 100 pieces: the Bell & Ross BR03-92 Bape Green Camo. Two watches were released. The first is the 25th Anniversary edition, limited to only 25 pieces worldwide. 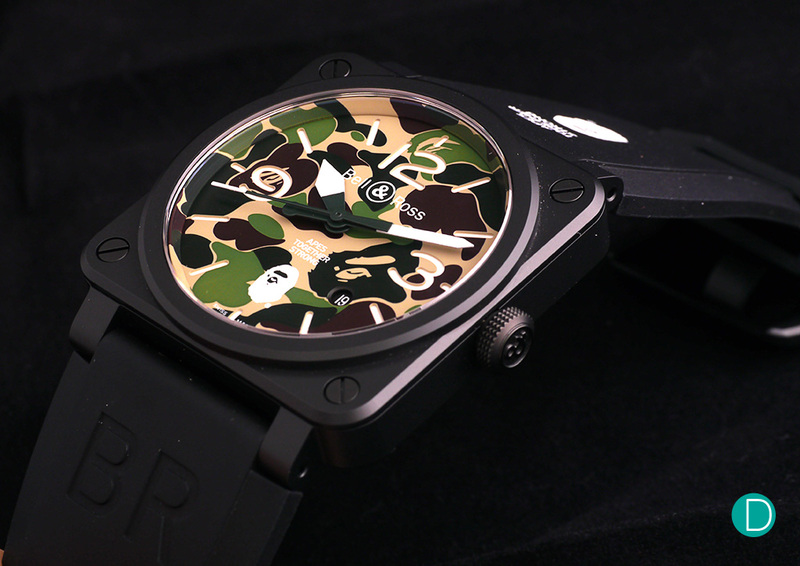 And the second is in a the signature green camouflage of Bape on the dial, limited to 100 pieces. 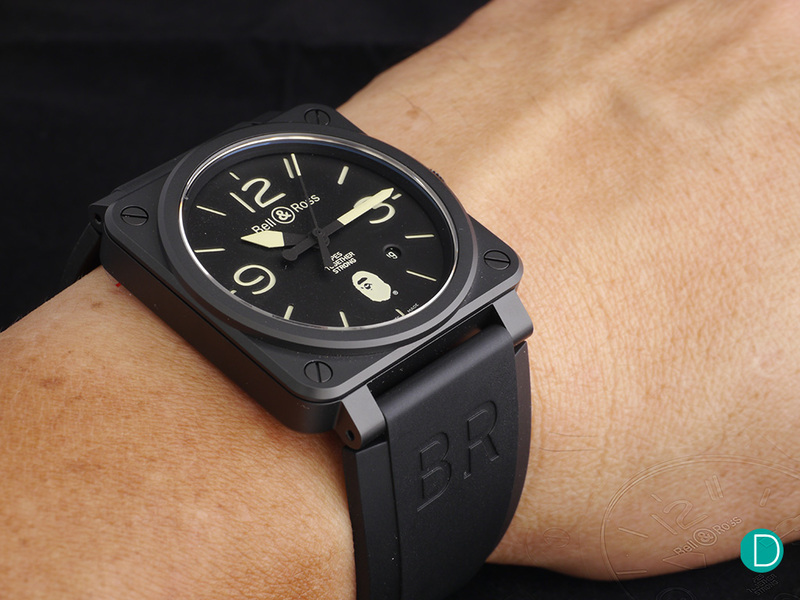 Both are based on the Bell & Ross BR03-92 square case – 42mm square, black matte, ceramic. As a recall, the BR03 is designed to look like analogue aviation counters, with the shape of the hands and typography of the numerals intended to ensure good legibility. The dials are a two piece construction, where the upper section is pierced around the numerals and indices to reveal the photoluminescent coating covering the lower insert. 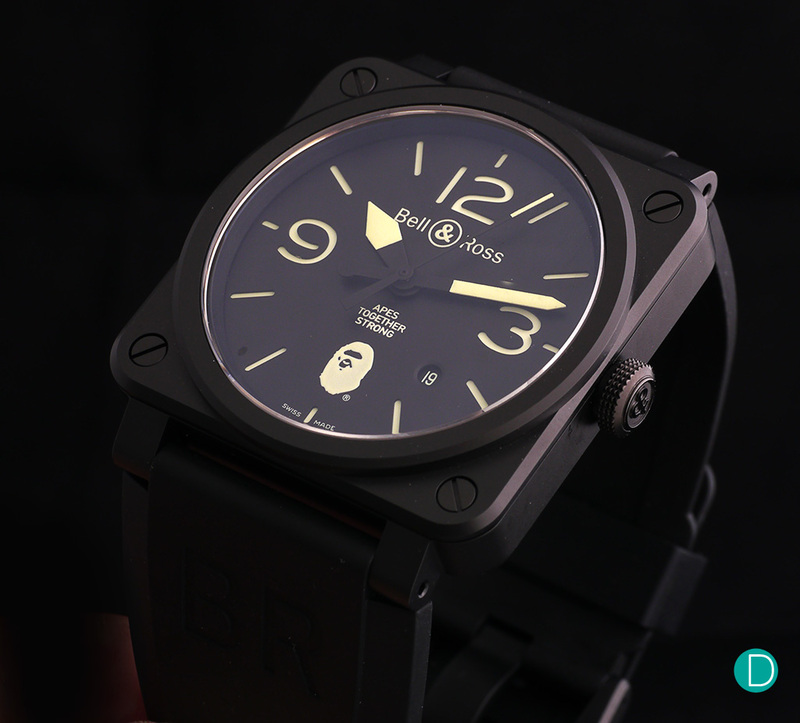 This technique was also used by Panerai in the early military watches they supplied to the Italian Navy. 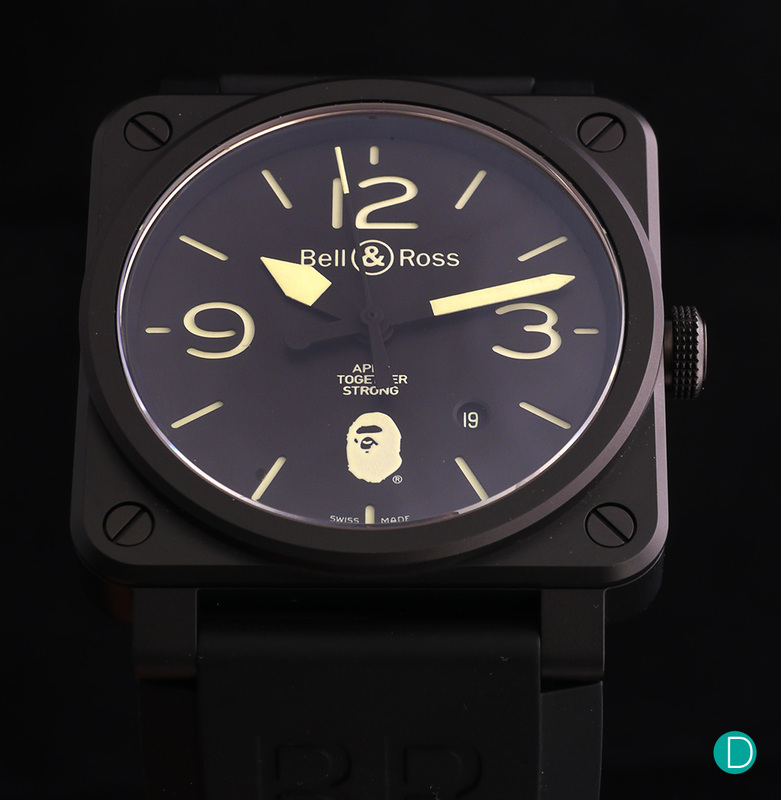 The hands used on both are the standard shape used by Bell & Ross for their square watches. The 25th Anniversary piece has a plain black dial, offering a very strong contrast, and highly visible in the day or night. 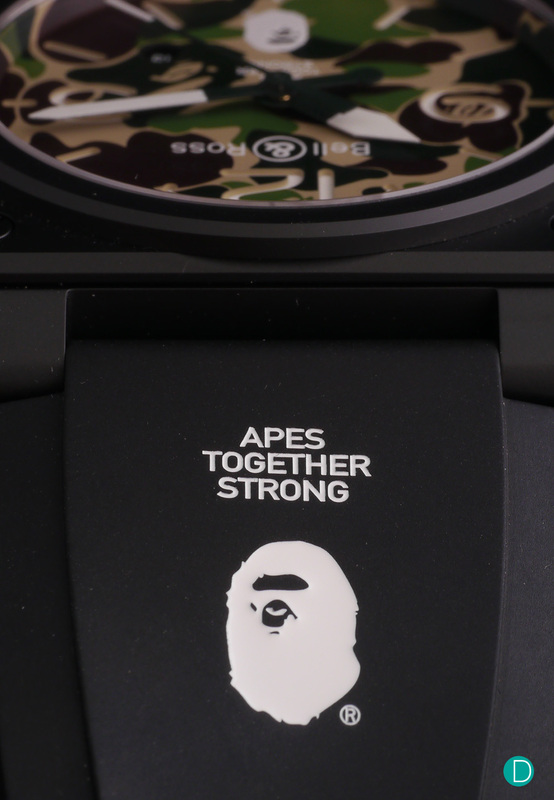 Bape’s logo, an Ape’s head in silouette is printed on the black dial at 6, and feature Superluminova C3 indices and hands. The Bape logo of the silhouette of an ape’s head is engraved and hand filled with lacquer. 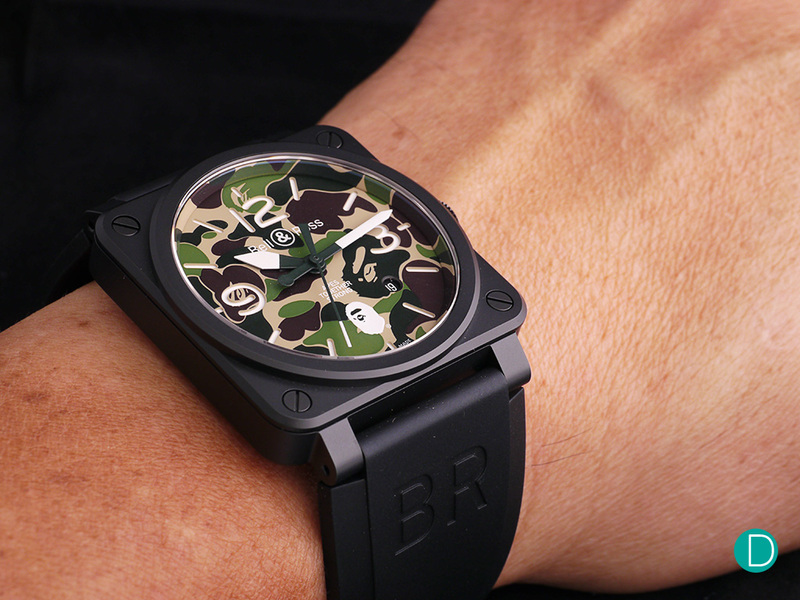 The BR03-92 25th Anniversary is delivered in a Pelican box and is available with two straps – a black rubber version with Bape’s iconic character engraved and hand filled with lacquer, and a leather strap featuring Bape’s trademark grey camouflage. The Green Camo model has a dial marked with the signature Bape green camo print, giving it a very distinctive and attractive look. 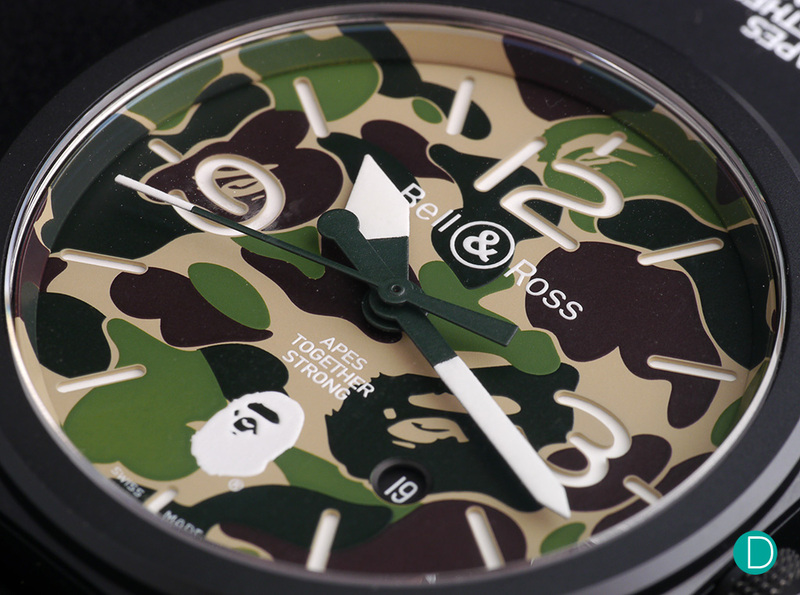 This model is limited to 100 pieces, and features the original green pattern of Bape’s CAMO on the dial. The feel is one which is nod to the military, and uses white numbers and the Ape head logo. 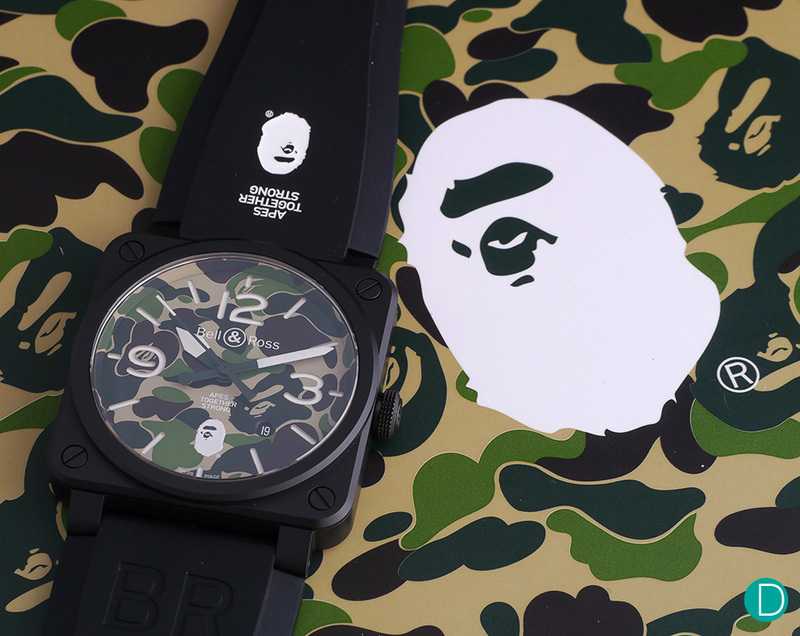 The dial certainly will be a match to Bape’s camouflage streetwear. 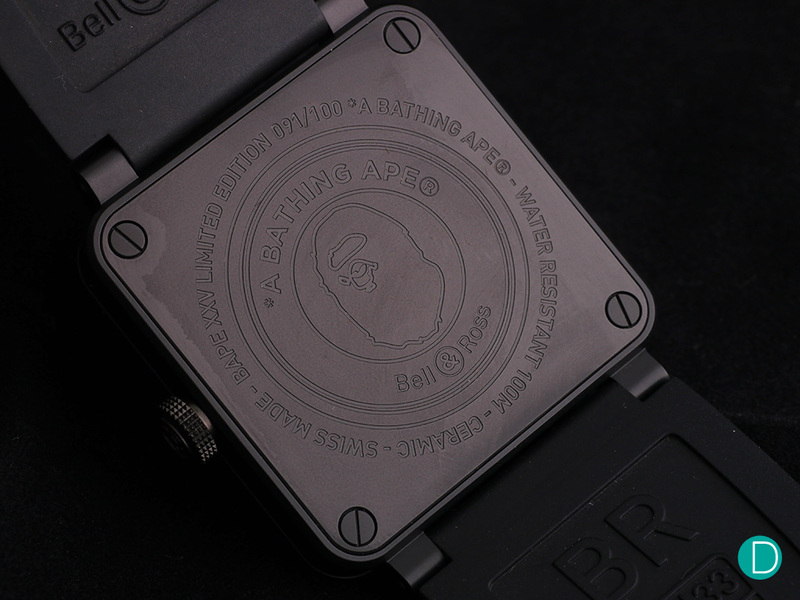 Both watches feature a covered case back, with engravings to mark their limited edition status and the collaboration with Bape. The movement is the Bell & Ross BR CAL 302 which uses the Sellita SW300-1. The movement is the same as is used in other square Bell & Ross watches like the BR-03-92 Diver. This is a rather standard automatic movement, which is robust and well proven. It offers approximately 40 hours power reserve and beats at 28,000 bph. 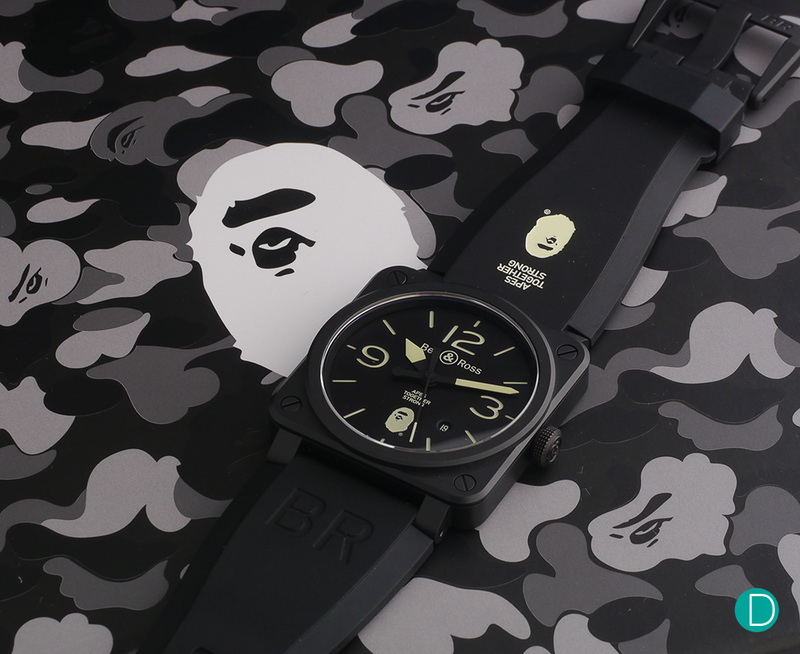 The watches are very attractive and goes well with the streetwear culture embodied by Bape. Very hip, and cool. If we were to express a preference, we find the Green Camo model to be more attractive, with the beautiful Bape signature camo pattern on the dial making it pop. However as we mentioned, both models are sold out, and we understand the limitation is so small that Bell & Ross boutiques carried out balloting to allocate the watches. On the wrist both watches feel comfortable. And the Green Camo shown here looks particularly hip and eye catching. The collaboration is an interesting exercise. We think perhaps since this is the first that Bell & Ross has done, they are still learning the ropes. We think, in the light that Bape is an extremely popular streetwear brand, perhaps the number of pieces are far too limited. We can see the link of 25 pieces to coincide with the 25th Anniversary, but it is far too small a limitation, leading to a great imbalance in the demand and supply curve. The Green Camo is limited to 100 pieces, and for a worldwide distribution, we also think is too small a collection. Movement: calibre BR-CAL.302. Automatic mechanical. Crystal: sapphire with anti-reflective coating. Functions: hours, minutes, seconds and date. Water-resistance: 100 metres. Case: 42 mm in diameter. Matt black ceramic. 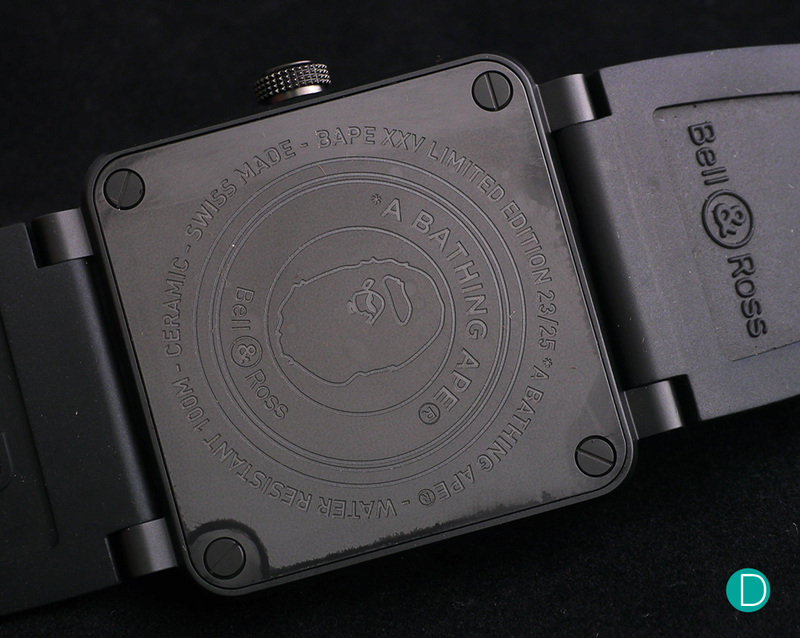 Straps: black rubber with APE® logo and Bape grey camo® calfskin Dial: matt black. Hands, numerals and indices coated in Superluminova®C3. Buckle: pin buckle. Black PVD. 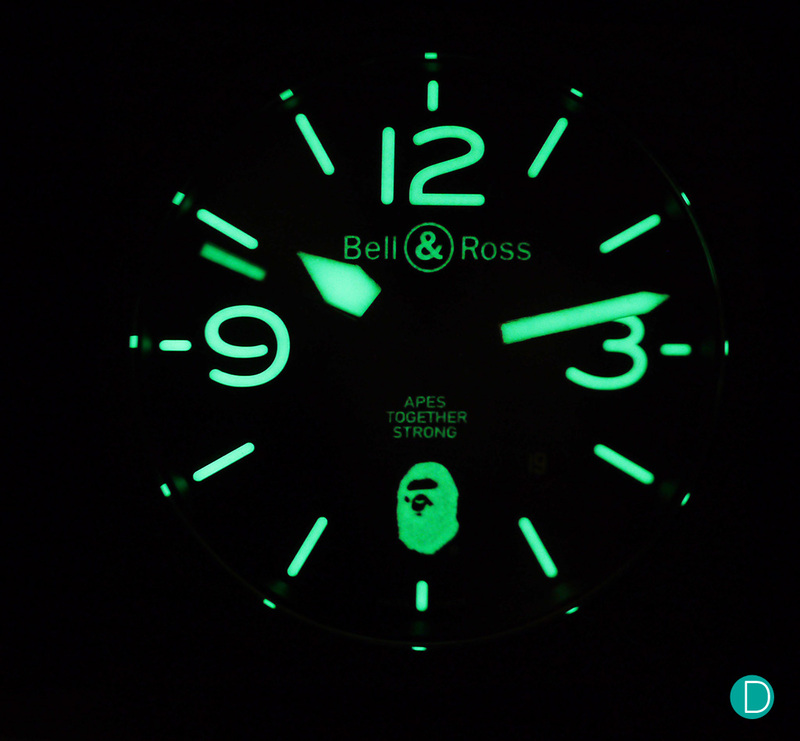 Strong, bright lume on both of the watches offer great legibility in the dark. Movement: calibre BR-CAL.302. Automatic mechanical. Crystal: sapphire with anti-reflective coating. Functions: hours, minutes, seconds and date. Water-resistance: 100 metres. Case: 42 mm in diameter. Matt black ceramic. Straps: black rubber with APE® logo and ultra-resilient black synthetic fabric. Dial: Bape green camo®. Hands, numerals and indices coated in white Superluminova®. Buckle: pin buckle. Black PVD.